This tab displays the commissions of the employee, according to the agreements and his contract with the organization. 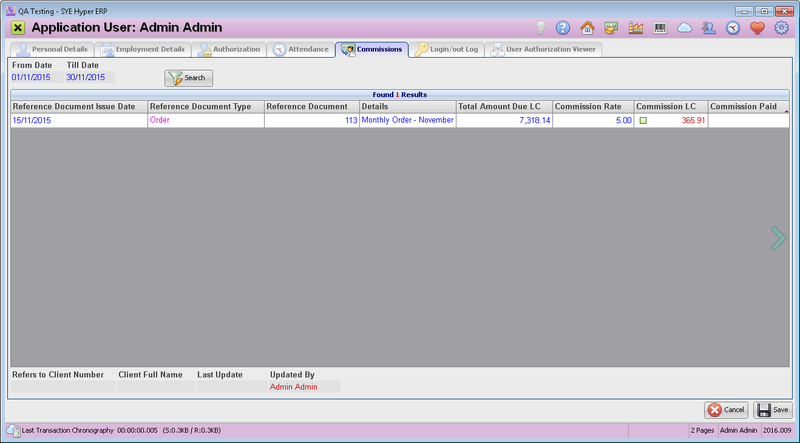 This tab allows the manager to update the commissions for the employee. In order to add or update commission, fill in the required information fields (as described at the bottom of this page). Please pay attention to the "Reference Document Type" and "Reference Document" fields. The "Commission LC" field is calculated according to the "Total Amount Due LC" and "Commission Rate" fields. Use the "From Date" and "Till Date" fields at the top of this tab and press the Search button, to display commissions for required dates. The information fields at the bottom of this tab, displays more details about the selected commission record.